June is Pride Month. I kicked off this month on June 1st by featuring LGBT short stories. I will continue to do so throughout the month by featuring short works written by gay authors, as well as books with LGBT themes. 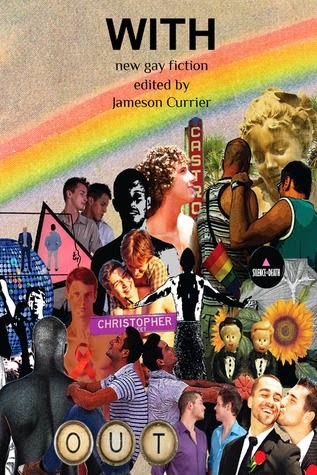 Today I would like to feature three short stories from With: New Gay Fiction edited by Jameson Currier (Chelsea Station, December 2013). This anthology features sixteen authors writing about all different types of relationships between gay men and others, including, but not limited to, lovers, family, friends, and acquaintances. I've been reading this book slowly and most likely will features other stories along the way. But today it is all about Michael Graves, Lewis DeSimone and Michael Carroll. Gold Mine is an engaging and deeply emotional read written from two points of view. First, we have the boy anxiously waiting for his lover's return from the Iraqi War, and then we have boy's grandmother whose keen observations are shared with the reader. Graves uses both perspectives to explore the boy's relationship with his lover, the grandmother's love and acceptance, as well as the rejection he experiences from family members and the lover's family. This piece is engrossing in style with a political flavor that feels a bit dated, but not so much that it is not pertinent today. Particularly since there are lovers still waiting for their loved ones to come home safely. Lewis DeSimone's In Pride focuses on today's issue of gay marriage and all the changes that the new laws bring to individual lives and to the gay community as a whole. It's a beautiful thing and San Francisco is celebrating. But it all comes down to analyzing change and effect in the life of his main character, and as he joins the throngs of those celebrating, the effect it will have on a few of his friends who come from an older generation as opposed to the younger members of the gay community. There are questions: Is this something he wants in his life? Should he settle for the young lover who's already in his life or should he search for the right person? Does he want to? Is there still a chance for him? This is a fantastic piece by DeSimone who hits the right tone while addressing the new choices available to the modern gay man from the perspective of an experienced, mature generation. Werewolf by Michael Carroll is one of those stories that just about anyone can relate to. It is about childhood friendships, you know, the ones that we let go with almost a sense of relief and later regret, usually when it's too late, because there are unresolved issues and feelings. In this case, Carroll's main character got there in time to say those last loving words to a dying friend and came to terms with rough realities. This is a deeply emotional, reality-based story that touches on the truth of those teen-year friendships that span years and in so many ways shape us.